Latvia, officially the Republic of Latvia, is a country in the Baltic region of Northern Europe, one of the three Baltic states. It is bordered by Estonia, Lithuania, Russia, Belarus and by a maritime border to the west with Sweden. Latvia has 1,997,500 inhabitants. Latvia is a democratic parliamentary republic established in 1918. The capital city is Riga. Latvian is the official language. Latvia is a unitary state. There are five planning regions: Kurzeme, Latgale, Riga, Vidzeme and Zemgale. Latvians and Livs are the indigenous people of Latvia. Latvian is an Indo-European language. Despite foreign rule from the 13th to 20th centuries, the Latvian nation maintained its identity throughout the generations via the language and musical traditions. Through Terra Mariana, Latvia and Estonia share a long common history. As a consequence of the Soviet occupation both countries are home to a large number of ethnic Russians, some of whom are non-citizens. Latvia is historically predominantly Protestant Lutheran and to a lesser extent Roman Catholic. Latvia is a member of NATO, European Union, United Nations, Council of Europe, CBSS (Council of the Baltic ASea States), IMF, NB8. a regional co-operation format that includes Sweden, Finland, Norway, Iceland, Denmark, Estonia, and Lithuania, NIB, OSCE, and WTO. It is currently in the accession process for joining the OECD. For 2013, Latvia is listed 48th on the Human Development Index and as a high income country until 1 July 2014. From 1 January 2014 it uses the euro. The Latvian Presidency of the Council of the European Union took place during the first half of 2015. Latvia will take over the Presidency from Italy and pass it to Luxembourg. To ensure the consistency, as well as the synergy, between the various elements of the implementation and preparation stage of the Latvian presidency there have been guiding principles defined in which the fundamental values of Latvia and the EU are reflected: involvement, growth, and sustainability. The guiding principles of the presidency offer a framework for the elaboration of the presidency working programme and priorities as well as development and implementation of the presidency communication strategy, the selection and training of personnel, planning the budget, logistics matters, and also public diplomacy and a cultural programme. Involvement - in which cooperation, solidarity and responsibility play a central role. Awareness that every action by individuals has a direct impact on society as a whole permits the promotion of well-being, security and the rule of law in order to stimulate economic and social freedom and personal advancement. Growth has its roots in inspiration when it comes to development towards excellence and the use of opportunities that are provided by a dynamic and constantly changing environment. It envisages not only taking pride in achievements, but also provides the challenge of mastering new areas of knowledge, skills and abilities, improving performance and know-how. Sustainability - the use of methods and practices, which stimulates the responsible, effective use of resources without jeopardising the ability of future generations to meet their own needs. The new National Library of Latvia, known also as the Castle of Light, has been designated as the main venue for the Latvian Presidency of the Council of the European Union. The building is one of the most significant 21st Century projects to be undertaken in Latvia, with the venue serving as a modern and multi-functional culture, education and information centre. Library is a symbol of knowledge. It proclaims the importance of aspiring to gain even higher levels of knowledge, this knowledge being the reward for those committed to reaching the peak, despite the challenge of attaining it. The Presidency is an opportunity for the Library to demonstrate that it is not only a symbol of the memory and knowledge of the nation, but an exchange between new experiences and culture. Traditional Latvian folklore, especially the dance of the folk songs, date back well over a thousand years. More than 1.2 million texts and 30,000 melodies of folk songs have been identified. Between the 13th and 19th centuries, Baltic Germans, many of whom were originally of non-German ancestry but had been assimilated into German culture, formed the upper class. They developed distinct cultural heritage, characterised by both Latvian and German influences. It has survived in German Baltic families to this day, in spite of their dispersal to Germany, the USA, Canada and other countries in the early 20th century. However, most indigenous Latvians did not participate in this particular cultural life. Thus, the mostly peasant local pagan heritage was preserved, partly merging with Christian traditions. For example, one of the most popular celebrations is Jāņi, a pagan celebration of the summer solstice—which Latvians celebrate on the feast day of St. John the Baptist. After incorporation into the Soviet Union, Latvian artists and writers were forced to follow the Socialist realism style of art. During the Soviet era, music became increasingly popular, with the most popular being songs from the 1980s. At this time, songs often made fun of the characteristics of Soviet life and were concerned about preserving Latvian identity. This aroused popular protests against the USSR and also gave rise to an increasing popularity of poetry. Since independence, theatre, scenography, choir music, and classical music have become the most notable branches of Latvian culture. 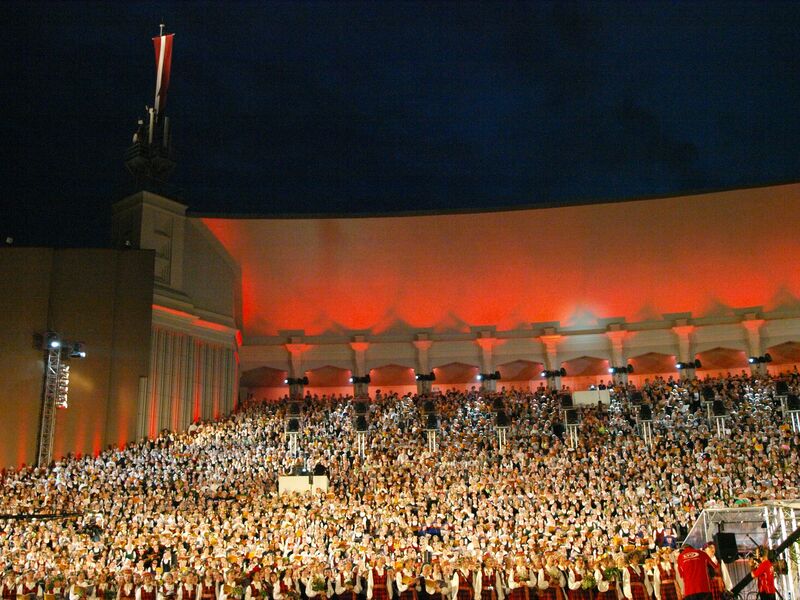 During July 2014, Riga hosted the 8th World Choir Games as it plays host to over 27,000 choristers representing over 450 choirs and over 70 countries. The festival is the biggest of its kind in the world and is held every two years in a different host city. Terra Mariana (Land of Mary) was the official name for Medieval Livonia or Old Livonia, which was formed in the aftermath of the Livonian Crusade in the territories comprising present day Estonia and Latvia. It was established on 2 February 1207, as a principality of the Holy Roman Empire but lost this status in 1215 when proclaimed by Pope Innocent III as directly subject to the Holy See.